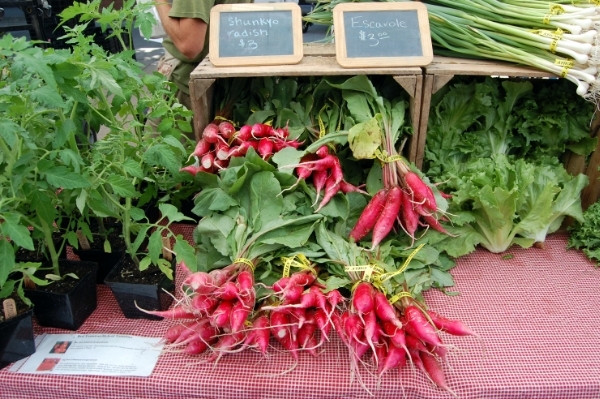 Shunkyo radish and escarole from Radical Root Organic Farm at Logan Square Farmers Market. Overcome your deipnophobia at The Dinner Party presented by Fear No ART at the Mayne Stage, this month with gumbo by Southern heirloom cooking expert, Big Jones’ chef/owner Paul Fehribach—plus microbrew beer and Vosges Chocolate samples. This episode of the live-action/live-streaming, dinner party/talk show features guests Crowns playwright Regina Taylor, The Interrupters director Steve James, Be The Groove artistic director Stephanie Paul, and Marco the Poet. Admission $25. Get cracking at the Summer Clam Bake at Barn & Company, the latest in the Pitmaster Dinner Series, hosted by the Low & Slow pyromancer himself, Gary Wiviott. Gary’s pièce de résistance will be a main course of grilled Maine lobster; Old Bay BBQ shrimp; buttermilk-brined and hot-smoked chicken; smoked clams, mussels, and Mikeska sausage—plus apps, sides, dessert, and paired cocktails. There will be more food than one human can possibly eat. Many have tried, all have doggy-bagged. Admission $40. Race on over as WBEZ’s own Richard Steele Goes to Bridgeport, specifically to Maria&apos;s Packaged Goods & Community Bar. “Richard [will] talk with residents and visitors about what it used to mean to be a black person in Bridgeport after dark and what it means now. Can a place change? What does it take? We&apos;ll talk about those questions and hear your reflections on how change—or not—in Chicago&apos;s neighborhoods affects us all. This event is another conversation in WBEZ and Vocalo&apos;s &apos;Race: Out Loud&apos; series.” My public service announcement: place your order at Pleasant House Bakery next door beforehand; they’ll deliver it to you at Maria’s. Admission FREE. Allez-y to the Taste of the Nation Chicago Pre-Event Kickoff Party at Studio Paris. “Paris Club signature small bites and cocktails” will be served, “with all proceeds benefitting Taste of the Nation.” TOTN Chicago is the annual fine dining tasting event of Share Our Strength, “a national nonprofit that is ending childhood hunger in America.” Admission $25. Dine at the Chef&apos;s Table—really the chefs’ Jenn-Air test kitchens—on the penthouse level of the historic Reid Murdoch Building, benefitting DIFFA/Chicago (Design Industries Foundation Fighting AIDS). “A celebration of CS Magazine&apos;s upcoming July Restaurant issue," the chefs include Nellcôte&apos;s Jared Van Camp, Spiaggia&apos;s Celeste Campise, Coco Pazzo&apos;s Kim Kilberg, Michael Jordan&apos;s Steakhouse&apos;s James O&apos;Donnell, The Bristol and Balena&apos;s Chris Pandel, Allium&apos;s Kevin Hickey, Wood&apos;s Ashlee Aubin, Inovasi and Moderno&apos;s John des Rosiers—plus mixologist Adam Seger, Moët Ice Imperial Champagne, and Jacques Torres chocolates. Admission $150. Meet the Market at Farmhouse, with a portion of the proceeds benefitting the Green City Market’s EBT Link matching program. “Enjoy cocktails and small bites with the Green City Market Junior Board and the farmers from King&apos;s Hill...Chef Eric Mansavage will feature snacks and cocktails using fresh produce from King&apos;s Hill...and Evanston&apos;s own FEW Spirits...featured sponsor for the evening.” Admission FREE, including food, but drinks additional with cost donated to GCM. Aux fourchettes citoyens to The Good Food Revolution: Celebrating the Heroes and Sheroes of the Movement at Growing Power&apos;s Iron Street urban farm. “You are invited to an evening to celebrate Growing Power&apos;s Chicago office&apos;s first official year of transforming Iron Street farm from an abandoned industrial building into a bountiful urban farm.” Province chef/owner Randy Zweiban “will prepare...farm-to-table courses showcasing Growing Power&apos;s produce and grass-fed poultry and beef...[plus] Heritage Wines and Revolution Brewery...wine and beer pairings...Farmer, founder, and CEO of Growing Power Will Allen will be present to do a book signing for his new book, The Good Food Revolution,” as recently bumped on The Colbert Report! Admission $50. Start celebrating America’s birthday The Chicago Way—early and often—at AmericaFest at Standard Market, which is in Westmont actually. “[W]atch cooking demonstrations by Standard Market chefs, enjoy the pig roast and beer garden...[and] savor the treats and samples from our vendors and farmers, many of whom make their products right here in Chicago.” Plus there’s a watermelon eating contest, where “for every watermelon eaten, we will donate two watermelons to a Westmont food pantry”. Admission FREE, including samples, but pig roast, beer garden, and crab cakes additional. Join me at Graze magazine’s Alphabet Soup: A Conversation with Local Food Writers at Revolution Brewery. Your ticket “includes [unlimited] pours of Revolution&apos;s five central beers as well as passed appetizers and a two-part conversation among talented wordsmiths,” with Soup & Bread’s Martha Bayne, ABC7’s Steve Dolinsky, Modern Baking’s Maggie Hennessy, Maria&apos;s Packaged Goods & Community Bar’s Ed Marszewski, Tasting Table Chicago’s Heather Sperling, Time Out Chicago’s David Tamarkin, the Chicago Reader’s Julia Thiel, and yours truly! “Graze is a [new] semi-annual literary magazine based in Chicago&apos;s Logan Square neighborhood that focuses on what&apos;s on the table as much as the folks sitting around it.” Admission $20.